Fortunately, Outlook offers a plethora of invaluable tools and utilities that can help. Here, I’ll share just a few tips for e-mail and calendar management that I hope will provide a brighter Outlook in your office. Any e-mail or alert sent directly to me is color-coded with eye-catching sky blue. When sorting my inbox, I know instantly that anything sky blue must be handled by me and not delegated to a member of my team. Correspondence to my entire team is color-coded forest green. Notifications that need my special attention are yellow, orange, gray, and brown (e.g., an e-mail letting me know that a ticket has entered the queue that needs to be addressed). Keep in mind that the human eye gravitates toward a disruption in the norm. If every e-mail in your inbox appears in black, anything sky blue, forest green, yellow, and so forth will jump out at you. Moreover, the simplest systems typically work best because they’re likely to be followed on a regular basis. Does this sound like it could work for you? Just follow these steps to get started. From the ribbon at the top of your inbox, go to View > View Settings. The Advance View Settings: Single box will appear. Click on Conditional Formatting… and then on the Add button. Click on Font to view a list of colors, sizes, and more; make your selections and click OK.
Click on Condition…. The Filter pop-up box will open to the Messages tab, where you can choose from the conditions that appear. As you exit, click OK each time you're prompted until the Advance View Settings: Single box closes. All messages sent to the e-mail address you chose will appear in your inbox in the color selected in step 4. 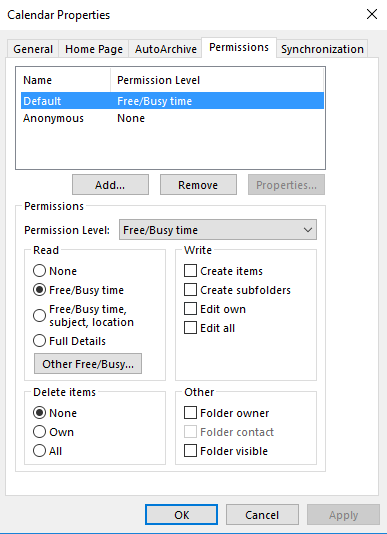 If you have a high volume of e-mail, sorting your inbox into folders, all controlled by Outlook’s outstanding Rules feature, is a great option. You can access Rules from the Move section of the task ribbon of your inbox, and then simply follow the prompts for adding or deleting criteria under Create a Rule or Manage Rules and Alerts. Let’s look at one example, my Technology folder, and the rules I’ve set up for it. One rule directs the e-mails sent to the entire Technology department to my main Technology folder. Since I’m also a member of four smaller teams, I have one subfolder for each team. Other rules direct the e-mails I receive from these teams to their respective subfolders. Because of these rules, everything in my Inbox is sorted and automatically placed in an appropriate folder. I don’t spend a single second manually dragging items from one folder to the next, saving a huge amount of time over the course of a day or week! For many advisors, the Rules feature is used to sort incoming client correspondence by client segment (A, B, and so forth). You could even take it a step further and create separate folders for each client or household—although this could get unwieldy, depending on how many clients you have. Did you know that Outlook allows you to share specific folders with staff members? For example, you could create a to-do folder and share it with your staff. Then, simply drop e-mails that need a response into that folder. That way, your staff members can periodically check the folder and grab the e-mails, handling the issues to be addressed without you having to assign them. It’s a small difference, sure, but extrapolate those few seconds saved to hundreds of e-mails and you’re looking at a very real, positive change. 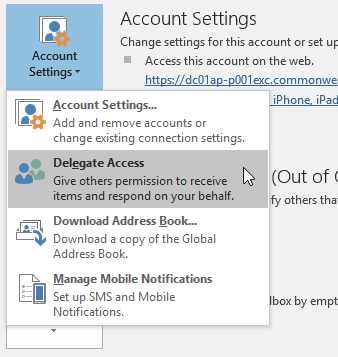 Another advantage of sharing folders is the ability to use Outlook’s Delegate Access feature. For the days or weeks of the year when you’re out of the office, you can grant a staff member permission to send an e-mail on your behalf (as opposed to sending it for you, which would be noncompliant). The Delegate Access feature is under the File tab in Outlook. First, click on Account Settings. Then, under the E-mail subtab, type in the e-mail address of the individual to whom you’ve delegated the responsibility of responding on your behalf. When you're away, the e-mails will still be sent to you, but because you've shared your inbox (i.e., your shared folders) with a designated individual, that staff member may access the e-mails and respond appropriately. As an added benefit, clients will feel confident in you when they see that you have a contingency plan in place, particularly for emergencies, whenever you are away. When working on a team, it’s helpful to keep up with your colleagues’ schedules. For example, each day, at least one member of my five-person team monitors incoming e-mails and tickets. Since we’ve granted one another access to our calendars, we can easily check to view who is scheduled to monitor our incoming e-mails and tickets each day. This helps us distribute work equitably and prevents potentially urgent e-mails and tickets from going unaddressed. Go to your personal calendar in Outlook. In the ribbon at the top of the screen, you’ll see a Share Calendar button. Sorting. You can also sort the calendars that you have permission to view into mini-groups, making it easy to check in on an entire team with a single click. Calendar groups can also be color-coded and renamed, making it easy to identify them at a glance. Permissions. Calendar-sharing doesn’t have to be an all or nothing choice. By setting permissions, you can hide various bits of data for events you share with your staff. You might share the title, subject, and location of meetings but keep the full details of your calendar to yourself. You can set permissions by clicking the Calendar Permissions button in the ribbon above your calendar. You can also set permissions by user. For example, you might want to share more details with a trusted, five-year staff member than a new hire. And, of course, for activities you don’t want anyone at work to know about, perhaps a doctor’s appointment, the Private tag is another useful Outlook feature. I hope I’ve shown here that Outlook is more than just a way to receive e-mail. 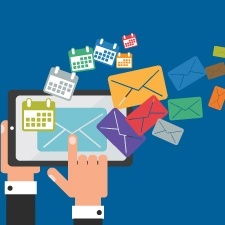 From using folders to delegate tasks to ensuring that important e-mails aren’t left unattended while you’re out of the office, I think these tips are just some of the ways Outlook can help you pave the way for a more efficient, interconnected practice. Do you have other Outlook tips that save you time? Do you color code your e-mails? Please share your thoughts with us below!